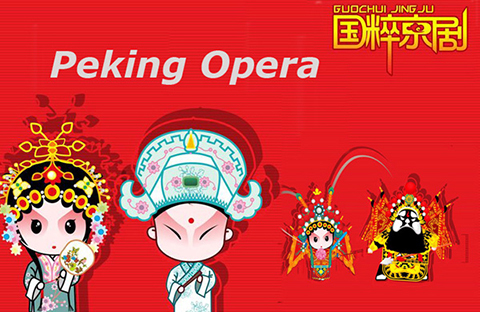 Chinese traditional operas, of a long history and well established, are one of the cultural and artistic forms of the Chinese nation. These ancient types of drama are still active on China’s stages today. Of all the traditional types of drama, Peking Opera is the most influential. Emerging in Peking two hundred years ago and popular throughout the country, Peking opera has a rich array of more than five thousand traditional items, mostly depicting ancient stories in China. After more than two hundred years of development, Peking Opera now boasts of many schools and masters of performing art. Each school has its own outstanding features and their performing skills are deeply loved by the audience. 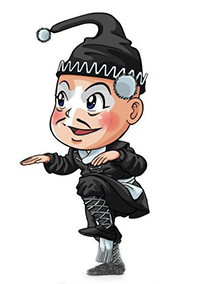 Characters in the opera are roughly divided into four types of role, namely: “生 (shēng), 旦 (dàn), 净 (jìng), and 丑 (chǒu).” Every type has its telltale facial makeup and decoration. “生 (shēng)” is the positive male role, “旦 (dàn)” is the positive female role, “净 (jìng)” is a supporting male role with striking character and “丑 (chǒu)” is the clown. Every type has its telltale facial makeup and decoration. ”Jìng” shì xìnggé xiānmíng de nánxìng pèijué. “Jìng” is a supporting male role with striking character. Tóngchuí: yě chēng “zhèng jìng,” bànyǎn shēn fèn zūnguì, qìdù wēiyán, xìnggé gāngzhí de juésè. 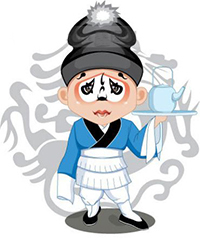 Tóngchuí of color face is a representative of honorable, dignified and upright role. Jià zǐ: yě chēng “fùjìng,” bànyǎn xìnggé háoshuǎng tǎnzhí 、huò lǔmǎng bàozào、huò yīnxiǎn jiǎozhà děng huāliǎn juésè. Jià zǐ is a representative of either rough man or a man who likes showing his ability to the full extent or a treacherous character. Wǔjìng: bànyǎn jīngtōng wǔyì , wǔdǎ yǒngměng de huāliǎn juésè. 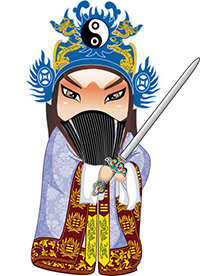 Wǔjìng is a representative of character who is versed in military arts and mainly makes acrobatic fighting. “Chǒu ”shì yōumò huájī huò fǎnmiàn juésè. Wénchǒu: bànyǎn shànliáng, jīzhì , yōumò huò bēiliè, yúchǔn, diāohuá děng juésè. 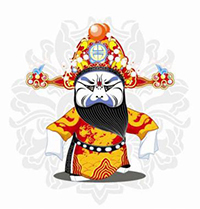 Wen Chou is positive humorous characters or negative cunning characters. Wǔchǒu: bànyǎn shēn huái juéjì, wǔgōng jīngzhàn de jiānghú xiákè huò wǔ lín gāoshǒu děng juésè. 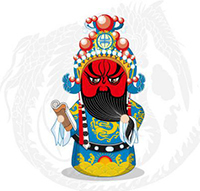 Wu Chou: A military hero adept in martial arts and given to chivalrous conduct. There is no lacking of social celebrities among Peking opera “票友 (piàoyǒu).” Emperor Guang Xu of Qing Dynasty, for example, was not only a good amateur Peking opera singer, but was also a good drummer in the Peking opera orchestra (the drummer plays the role of the director of the orchestra). The Empress Dowager was an avid Peking opera fan, too. The huge three-storey theater in the Summer Palace is a proof of her love for Peking opera.